Melissa McCarthy is one of the biggest names in comedy today, but her post-Bridesmaids career hasn’t been particularly fruitful. Sure, most of her films have made quite a bit of money and they’ve been a hit with audiences, but I don’t think that she’s had a truly funny film in years. Spy reteams her with Paul Feig (director of Bridesmaids and The Heat) and their third collaboration together is modestly successful. It’s only sporadically funny thanks to a mediocre script, but the film is actually pretty well directed and some fantastic comedic performances are able to elevate any of the subpar humor. Nothing about it is particularly memorable, but it moves at a quick enough pace to make this a decently entertaining summer comedy. CIA analyst Susan Cooper (Melissa McCarthy) operates behind a desk, feeding intel into the ears of agents in the field. Her partner is Bradley Fine (Jude Law) a suave agent who relies on Cooper to keep him alive. While trying to discover the location of a missing nuclear weapon, Fine is killed by Rayna Boyanov (Rose Byrne). Boyanov informs the CIA that she knows every one of their active agents and she will kill any of them that try to stop her. But she has no idea who Susan Cooper is, so this gives Cooper the opportunity to leave her desk behind and embark on an actual mission. McCarthy has gotten a lot of flak from people lately, with a lot of her naysayers claiming that she plays the same character over and over again. I genuinely think that she’s pretty funny in this film, portraying an everyday woman who gets wrapped up in a larger than life adventure quite well. Her delivery and occasionally over the top comedic performance carries the film and makes it an easy watch. But the standouts of the film for me are two members of the supporting cast: Rose Byrne and Jason Statham. Neither of them are known first and foremost for their comedy, but they’re both hysterically funny in this film. Byrne makes a great villain and her part probably wouldn’t have provided any laughs with a lesser performer in the role. Statham has a lot of great opportunities for humor and he nails every single one of them. One of the funniest moments in the film features Statham giving an extended explanation of all the impossible things that he has done as a secret agent. Jude Law’s character doesn’t provide many laughs, but he’s perfect for the role and does a great job with what he’s given. I wish that I could write more about Spy, but a lot of the film is actually pretty forgettable. I had some solid belly laughs, but looking back on the film I can hardly remember what jokes were worth talking about. The script by Feig doesn’t offer a lot of surprises in the humor department, with a lot of jokes feeling either mediocre or done before. The script also forces way too much plot into the end of the film that gets in the way of any remaining jokes. But there are actually some well-directed action scenes here, particularly a fight involving McCarthy that takes place in a kitchen. So even though the humor isn’t particularly memorable, there’s just enough talent on display in front of and behind the camera to warrant a recommendation. Comedy films often work best with a simple premise; complicate the story too much and there won’t be enough room for jokes. 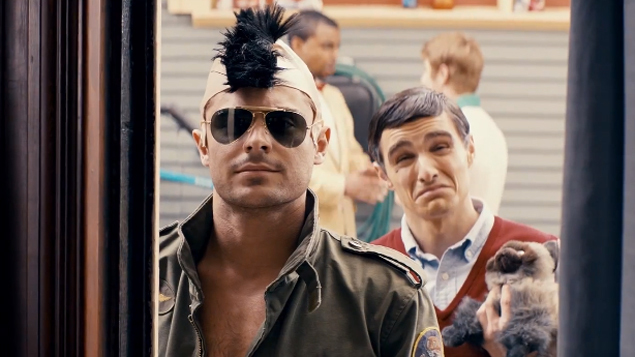 Neighbors has a very simple premise, but it’s also a good one: what if a fraternity moved in next door? This solid premise should have delivered great jokes that generate big laughs, but one can’t help feeling underwhelmed. Sure, there are some chuckles to be had, but there’s certainly not enough to make this comedy as hilarious as it should have been. Mac and Kelly Radner (Seth Rogen and Rose Byrne) are a young couple with a newborn daughter. They’re having trouble adjusting to their new lifestyle and they may not want to give up their youth just yet. One day, a fraternity moves into the house next door to them. They visit the house and talk to the fraternity’s leader Teddy Sanders (Zac Efron) and ask him to keep the noise down. Teddy agrees, as long as they promise to come to him with any complaints and not call the police. Mac and Kelly agree to this promise, but end up breaking it one night when Teddy doesn’t answer his phone. They call the cops and upset Teddy in the process. He decides to make Mac and Kelly’s life a living hell, but they’re not going down without a fight. Written by Andrew J. Cohen and Brendan O’Brien, the film’s script doesn’t supply enough jokes to keep audience members laughing through the entire film. When the laughs do come, they mostly amount to a few chuckles here and there, with only a few truly hilarious scenes in the whole film. This is a raunchy movie, which is perfectly fine, but this film’s raunchy jokes feel like they are simply there to gross out audience members and earn an R rating. Raunchy jokes can be hysterical if they are done well, but here they lack the wit and cleverness that many of Seth Rogen’s best films have had. While the film’s script fails to deliver the jokes, it does successfully provide each major character with a well-constructed character arc. Mac and Kelly terrorizing the fraternity to stay young and Teddy terrorizing the family next door because of his fear of growing old adds a nice dose of warmth into what could have been a very cynical film. Even though the film isn’t as funny as it should have been, director Nicholas Stoller always keeps the film incredibly watchable. With a short runtime, the film moves along at a nice pace and never drags. This is a great looking film and the party scenes within the fraternity’s house are especially gorgeous. Stoller and cinematographer Brandon Trost give each party a distinct look and personality, despite taking place in the same location. Seth Rogen and Rose Byrne have excellent chemistry together and Zac Efron gives what might be the best performance of his career, but even they can’t save Neighbors from feeling like a disappointment. The film is put together nicely, but most of the humor can’t live up to the film’s great premise. Leaving the theater, one can’t help but wonder how much funnier this could have been. What should have been the best comedy of the summer is nothing more than a passable 96 minutes.